The Results Are In: What Are the Most Difficult Attributes to Assess During an Interview? In our May poll question we asked what you find to be the most difficult attributes to assess while interviewing a job candidate. And the results were conclusive. 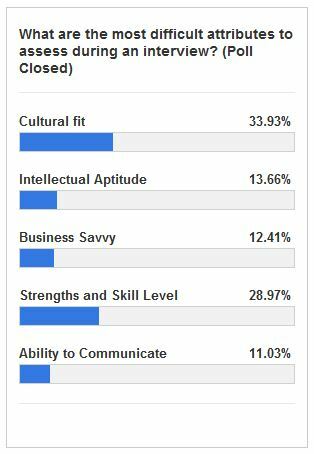 Cultural fit was picked as the hardest to assess followed by strengths and skill level. These results are on par with current workforce trends. Cultural fit is a hot topic in organizational management right now, and studies have shown that a well-defined company culture can have a major impact on productivity, profitability, and perhaps most importantly – employee engagement. According to research by Gallup, 71% of workers are, to some degree, disengaged in their work. It’s an unsettling statistic that may have major implications on overall organizational health in businesses across all industries. The “quit-and-stay phenomenon” is a term that refers to those employees who have checked out of the job mentally, but still continue to come in to work each day. These workers can be toxic and if left unchecked, could easily spread their disengagement throughout your organization. A strong corporate culture not only helps motivate the disengaged by reinforcing exactly what it is the company is working for and how each employee contributes to overall goals, but if applied correctly, it can also help drive positive hiring practices. It’s important to make a conscious effort to look deeper into a job candidate than just tangible qualifications like education, seniority, or work-experience, and consider whether or not they truly represent your company’s culture. From the day-to-day tasks to big-picture strategy development, an employee who is a strong cultural fit will be more actively engaged in all facets of their job. Does a Job Candidate Fit Your Company’s Culture? Does your company put a an emphasis on culture? What are some ways you assess whether or not a job candidate will be a strong cultural fit? Let us know in the comment section below.